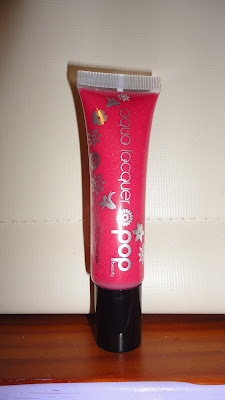 Modern Beauty Girl: POP Beauty Aqua Lacquer (Floating Rose) Review! I got the POP Aqua Lacquer in Floating Rose in my October birchbox! I already did an unboxing post on my october birchbox, so if you missed that, I'll link it here for you guys! So let's start of with packaging. It is pretty trippy because it looks like a normal squeeze type lipgloss with a slant applicator, but when you open it, it has a plastic applicator. I like this concept because you can squeeze the tube to load up your wand when you start running low on product, but I'm not a huge fan of the applicator. It is sort of just a flat plastic thing and it doesn't apply the lipgloss well. It is a little too big for the corners of my mouth and it's just awkward to use. I would rather have a brush or doe foot applicator, but thats just my opinion! The shade that I got is floating rose. It is a nice bright rose pink. It is kind of leaning on the warmer side and it has a little bit of gold shimmer in it, but its not frosted or anything like that. This shade is a great every day shade and it applies really well and doesn't get stuck in lip lines or anything like that. This lipgloss is not sticky at all, which I know some people will love. For me personally, I like mine to have a little more of a tacky feel, but that's just personal preference. Unlike some other slick feeling lipglosses, this one has pretty good staying power lasting 4 hours when I do moderate talking and minimal eating and drinking. Obviously, it'll fade faster if you talk more or eat or drink more. It has a very cooling feeling when applied similar to the artistry lipglosses if you've tried them. It has a slightly minty scent and that is probably what gives it the tingle on the lips, but if you don't like mint don't be alarmed because the smell is very light! So overall, I will rate this maybe a B+! I like the color and the feel of the product, but that applicator is just so difficult to use! Let me know if you've tried any POP beauty aqua lacquers and what you think of them in the comments below! Looks really nice on your lips, I am more of a lipstick girl but every now and then I like a good shiney lip, makes them look bigger! thanks! and I'm the same way! I usually tend to go for lipstick because my hair gets stuck in my lipgloss most of the time! I reviewed this gloss on my blog too - I would give it the exact same grade! Great gloss but that applicator is so weird!